The classic combination of rhubarb and strawberries makes this easy strawberry rhubarb jello mold a winner in any league. Make it for your next family get-together! Dissolve gelatin in 6 cups hot water. When slightly thickened, add remaining ingredients. Pour into a 12 cup mold and chill. 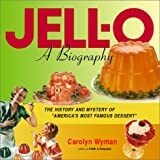 Choose your favorite jello cookbook at Amazon.com, or give one as a gift to a friend. Rate this recipe or send me your own recipe ideas! Complete the following form for an easy way to keep updated on all things strawberry. New recipes, readers' comments, gift ideas, trivia, tips and more. It's FREE!